‘Those who cannot remember the past are condemned to repeat it,’ George Santayana, philosopher and Harvard professor. The nightly news rings alarm bells for many people who have studied history or have lived experiences of the impact of colonialism, nationalism, fascism, war, or dispossession. Our keynote speaker, Paula Morris, addresses the role a novelist plays in illuminating past events that resonate in modern times; and whether historical fiction can engage readers who might not see the parallels between past and present. Our Guest of Honour, Jackie French, was the 2014/15 Australian Children’s Laureate and 2015 Senior Australian of the Year. Historian, ecologist, literacy advocate, and author of over 140 books for all age groups, she holds more than 60 awards in Australia and overseas. Join Jackie Ballantyne in conversation with Jackie to discover insights into her novels, her writing processes, her approach to history, and other aspects of her impressive career. Sophie Masson and Kelly Gardiner have successfully tackled writing for children, young adults and adults. Between them their bibliographies include historical fiction, non-fiction, picture books, plays, magazine articles and short stories with their imaginations crossing historical sub-genres of fantasy, mystery, thrillers and time slip. Join Robert Gott as he discovers the secret to their versatility, and the approach they take to engaging different audiences. Elizabeth I and Joan of Arc have long been the subjects of countless books, engendering myth, obsession, and various interpretations of the lives. Linda Funnell asks Jane Caro and Ali Alizadeh why they chose to investigate the stories of these famous women, and how they bring fresh perspective to their histories. A husband poisoner, a transgender man accused of murder, and a psychopathic highwayman feature in recent books by Janet Lee, Pip Smith and Catherine Jinks respectively. Rachel Franks explores the criminal mind with these authors, the mysteries that surround their protagonists, and the tricky business of determining innocence or guilt from historical sources. Winton Higgins’ Rule of Law examines the psyches of Nazi monsters and their prosecutors in a fictional account of the Nuremberg Trials. Michelle Aung Thin’s The Monsoon Bride deals with the quest for liberation in 1930s Burma while addressing a multicultural and colonial past. Lucy Treloar’s Salt Creek explores the repercussions on the lives and fragile ecosystems of traditional custodians caused by white settlement. Kelly Gardiner talks to these authors about why these subjects matter to writers and readers, and what we can learn from these histories. Enjoy our signature pitch contest with $200 prize money on offer. ‘First page’ pitches from aspiring authors are read by a narrator to industry experts who will provide a critique of chosen submissions. The session will provide other attendees with a chance to learn what attracts the attention of agents and publishers when seeking new historical fiction. Entrants will remain anonymous other than the winner of the contest. Our judges are Clare Hallifax (Scholastic), literary agent Margaret Connolly and Michelle Lovi (Odyssey Press). Rachel Nightingale will act as narrator. After a huge day at the conference, join us at our conference dinner. The first sessions of Stream 2 are shared with Stream 1, above, to welcome you to the conference. Join us to hear our keynote and special guest speakers. Stream 2 begins after morning tea. Successful historical romance seldom ends when the last page is turned. How do writers continue to engage readers throughout a series with new takes on an age old love story ? Anne Gracie explores the art of keeping the romance fresh over multiple story arcs both within one book and across a saga with Elizabeth Ellen Carter, Renee Dahlia and Lizzi Tremayne. Releasing a novel is a dream come true but what happens after you’ve given birth to your ‘book baby’? How does an author spread the word? What is the role of a publicist? How do you catch a bookseller’s attention? And what strategies can indie authors employ to connect with readers not available to traditionally published writers? Author Lucinda Brant, Debbie McInnes (DMCPRMedia) and Melanie Prosser (Berkelouws Bookshop) answer these questions and more with Gabrielle Ryan. Legally you may not be liable for ‘defaming the dead’ but should an author do so? Depicting the life of a real person can lead to ethical questions as to how to portray their thoughts, motives, and actions, based on historical sources and hearsay. 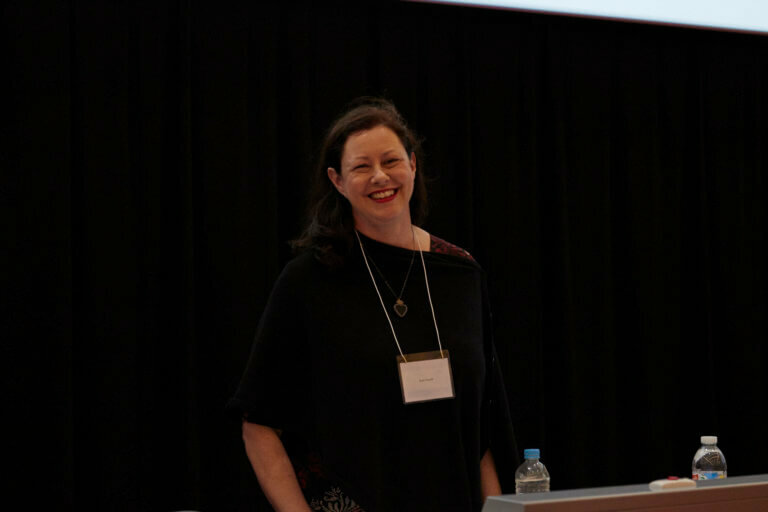 Catherine Padmore discusses respectful research methods, and the obstacles and dilemmas of biofiction, with Paula Morris, Isobel Blackthorn and Greg Johnston. Creative writing postgraduate degrees have become increasingly popular in the last decade. Associate Professor Sara Knox (WSU) talks to Dr Jesse Blackadder, Dr Rachel le Rossignol and PhD candidate, Majella Cullinane, about the benefits of combining the process of completing a novel with a deeper examination of the genre’s purpose, themes, and interpretation of research. Join us for afternoon tea followed by our famous First Pages pitch contest (see Saturday, Stream 1). After a full day of listening, talking, reading, watching and smiling, join us for the conference dinner.